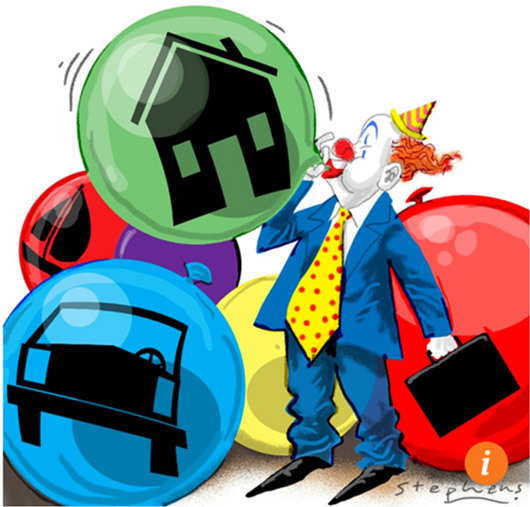 Is the Bubble Economy Set to Burst? My friend Andy Xie, based in Shanghai, is a very independent-minded investment analyst and economist. With a PhD from MIT, he has been at the IMF and was a star economist for the Morgan Stanley Asia-Pacific group. His ofttimes bearish calls on various parts of the Chinese economy have elicited a lot of criticism from Chinese officials and retail investors. I have been on the stage with him several times, both on the same side of debates and on opposite sides – he is a formidable opponent! We do have one thing in common: While we may be often wrong, we are seldom in doubt and certainly not afraid of letting others know what we think. Forcefully. This week Andy posted an essay in the South China Morning Post: “The bubble economy is set to burst, and US elections may well be the trigger.” I find that interesting. Here I am looking at the problems in China as potentially triggering global problems, and he is looking at elections in the US. I wrote my doctoral thesis arguing that Japan was a bubble in late 1980s, a long report at the World Bank in the early 1990s arguing that Southeast Asia was a bubble, research notes at Morgan Stanley in 1999 calling dotcom boom a bubble, and numerous research notes from 2003 onwards arguing that the U.S. property market was a bubble. On the other hand I have never called something a bubble that turned out not to be a bubble. In today’s Outside the Box Andy looks at what he thinks is the cause of the current bubbles that he sees around the world: central bank intervention. And I agree. I find it fascinating that Yellen & crew are puzzled at the lack of inflation in their CPI measure but don’t see a problem with inflation in asset prices. In fact, they see rising home prices and nosebleed-high stock prices as good things and are quite proud of having fostered those. The fact that they came along with credit bubbles around the globe, fostered by ultra-low rates, is something they are willing to ignore. I am more convinced than ever that we are rapidly moving into a world where the unthinkable –and I mean truly unthinkable – is going to be not only thought about but acted upon. Damn the torpedoes and all that stuff. I think you will enjoy Andy’s insights. There are some 15 independent advisors and brokers from around the country coming over, along with my various partners and associates. These evening dinners have evolved into a meet and greet with hors d’oeuvres and wine, then the food, and then we all move to the “family room” (it’s really just a big open space) where I sit on a high stool and answer questions. We start by asking these advisors what is the one thing their clients are most worried about and what is the one thing they themselves are most worried about. It makes for a provocative conversation. I woke up yesterday morning finally feeling normal again and able to sit down and begin to work through my email inbox, where I found 415 messages. That’s after I deleted the obvious ones. Sigh – I know what I will be doing for a few days. You have a great week, and try not to let your inbox overwhelm you – get out and do something fun. Central banks continue to focus on consumption inflation, not asset inflation, in their decisions. Their attitude has supported one bubble after another. These bubbles have led to rising inequality and made mass consumer inflation less likely. Since the 2008 financial crisis, asset inflation has fully recovered, and then some. The US household net worth is 34 per cent above the peak in 2007, versus 30 per cent for nominal GDP. China’s property value may have surpassed the total in the rest of the world combined. The world is stuck in a vicious cycle of asset bubbles, low consumer inflation, stagnant productivity and low wage growth. The US Federal Reserve has indicated that it will begin to unwind its QE (quantitative easing) assets this month and raise the interest rate by another 25 basis points to 1.5 per cent. China has been clipping the debt wings of grey rhinos and pouring cold water on property speculation. They are worried about asset bubbles. But, if recent history is any guide, when asset markets begin to tumble, they will reverse their actions and encourage debt binges again. Recently, some central bankers have been puzzled by the breakdown of the Philipps Curve: that falling unemployment rates would lead to wage inflation first and consumer price inflation next. This shows how some of the most powerful people in the world operate on flimsy assumptions. The loss of competitiveness changes how macro policy works. Japan has been losing competitiveness against its Asian neighbours. As its population is small, relative to the regional total, lower wages in the region have exerted gravity on its labour market. This is the fundamental reason for the decoupling between the unemployment rate and wage trend. The mistaken stimulus has the unintended consequences of dissipating real wealth and increasing inequality. American household net worth is at an all-time high of five times GDP, significantly higher than the bubble peaks of 4.1 times in 2000 and 4.7 in 2007, and far higher than the historical norm of three times GDP. On the other hand, US capital formation has stagnated for decades. The outlandish paper wealth is just the same asset at ever higher prices. The inflation of paper wealth has a serious impact on inequality. The top 1 per cent in the US owns one-third of the wealth and the top 10 per cent owns three-quarters. Half of the people don’t even own stocks. Asset inflation will increase inequality by definition. Moreover, 90 per cent of the income growth since 2008 has gone to the top 1 per cent, partly due to their ability to cash out in the inflated asset market. An economy that depends on asset inflation always disproportionately benefits the asset-rich top 1 per cent. China’s model is to subsidise investment. The resulting overcapacity inevitably devalues whatever its workers produce. That slows down wage rises and prolongs the deflationary pull. This is the reason that the Chinese currency has had a tendency to depreciate during its four decades of rapid growth, while other East Asian economies experienced currency appreciation during a similar period. Hot stocks or property are sold like Hollywood stars. Rumour and innuendo will do the job. Nothing real is necessary. A “Yes, but” emerged from last week’s global gathering of policymakers that provides a comprehensive check-up for the global economy. In Washington for the 2017 Annual Meetings of the International Monetary Fund and World Bank, officials from almost 190 countries mixed excitement about the improving prospects for the global economy with caution about a list of actual and potential challenges. And with both sides of this ledger having grown during the past few months, it is a configuration that amplifies the contradictions that traders and investors have to navigate down the road but, for now, are comfortable to profitably ignore. - A pick up in economic growth that is becoming broader and more durable. The IMF now projects global growth to increase from 3.2 per cent last year to 3.6 per cent in 2017 and 3.7 per cent in 2018. - Loose financial conditions that support consumption, and do so without a worrisome increase in inflation and inflationary expectations. - Very low financial market volatility that, now common to virtually all market segments, allows the wave of higher valuations to reach far and deep. - Hope that economic growth could be turbocharged by long-awaited progress in implementing more pro-growth policies, particularly in Europe and the US. - Limited understanding of key economic relationships in advanced countries (such as productivity, wage determination and inflation dynamics), as well as the impact of technological innovation. - The “hot potato” dimension of today’s foreign exchange markets in which virtually no country is able and willing to live with a sustainably stronger currency. Uncertainties about the impact of an eventual normalisation of monetary policy in more than one systemically-important central bank, together with those relating to trading arrangements in Europe and North America. - Growing backlash against big tech in the context of a catchup, both by governments and the companies themselves, to the sector’s systemic importance. - An international economic order facing greater probability of fragmentation along national and regional lines. - The geopolitics of North Korea’s brazen nuclear threats. - Persistent inequalities that fuel the politics of anger, social divisions and party polarisation. While both sides of this ledger have increased over time, traders and investors have been profitably focusing elsewhere — that is, applying a “buy-the-dip” (any dip) strategy that has served them well. It involves ever greater exposures to credit, liquidity and volatility risks that, over the past few months, have spread from advanced countries’ stocks and bonds to virtually every corner of the public markets around the world. And it is a phenomenon that is being structurally embedded through the proliferation of a growing array of low-cost passive products, notably ETFs, that implicitly promise investors instantaneous liquidity at reasonable bid-offer spreads in asset classes that, in the past, have suffered numerous liquidity strains. Over time, this confluence of factors sets the global economy and markets on course for a tug-of-war among dramatically opposing possible outcomes. If the “Yes” prevails, the result would include higher and more inclusive growth, a validation of elevated asset prices, the orderly normalisation of unconventional monetary policy, reduced cross-border tensions and an improved environment for national politics. However, a decisive tip towards the “But” would threaten recession and unsettling financial instability, increase the risks of a policy mistake, worsen trade and currency tensions, and fuel more divisive national politics. It is very hard to predict with a high enough degree of confidence the timing and direction of the eventual resolution. In the meantime, only major disruptions are likely to dissuade traders and investors to abandon what most dream of — a strategy that reliably rewards them and even has some legitimate justification (that is, the ample availability of liquidity from central banks and the corporate sector). In the meantime, both sides of the ledger will continue to grow. INEQUALITY is one of the big political issues of the 21st century, with many commentators citing it as a significant factor behind the rise of populism. After all, nothing could be more indicative of the triumph of the common man than the elevation of a property billionaire to the American presidency. A new IMF report* looks at how fiscal policy can help tackle inequality. In advanced economies, taxation already has an impact. The Gini coefficient (a standard measure of income inequality) is around a third lower after taxes and transfers than it is before them. But whereas such policies offset around 60% of the change in market inequality between 1985 and 1995, they have had barely any impact since. That is because of a change in policy direction. Across the West, taxes on higher incomes have generally fallen. This could be for a number of reasons, the IMF says. The tax take from high earners could have become more “elastic” (ie, sensitive to rate changes); in a mobile world, the elite will move countries to reduce their tax bills. But there is no sign that elasticity has increased in recent decades. A second possibility, easily dismissed, is that the share of income taken by the rich might have fallen; it has, of course, increased. A third option is that society reached a consensus that tax rates needed to be cut to help the rich. In fact, surveys show that people are more in favour of redistributive policies than they were in the 1980s. Another reason that governments might have driven down top tax rates could be to create greater incentives to invest, thereby boosting economic growth. That certainly seems to be the rationale behind the cuts being proposed by President Donald Trump. But the IMF, after analysing tax rates in OECD countries between 1981 and 2016, found no strong relationship between how progressive a tax system is and economic growth. Indeed the study adds that for countries wanting to redistribute wealth, there may be “scope for increasing the progressivity of income taxation without significantly hurting growth”. The latter sentence will be seized on by politicians on the left. But the argument works better in some places than in others. The IMF reckons that the optimal tax rate on higher incomes, assuming the aim is revenue maximisation, is 44%. Britain’s highest rate is already 45%. So the IMF study does not really provide much ammunition for Jeremy Corbyn, the leader of the Labour Party, the main opposition, who wants to raise it to 50%. It is a better argument, perhaps, for Bernie Sanders, the Democrat, since the top American tax rate, before any Trump cuts, is only 39.6%. Even here, a note of caution is needed. Companies are inclined to move in search of more favourable tax treatment—hence the success of Ireland in attracting business with its 12.5% corporate-tax rate, and the row about “inversions” where American companies move overseas to lower-tax jurisdictions. 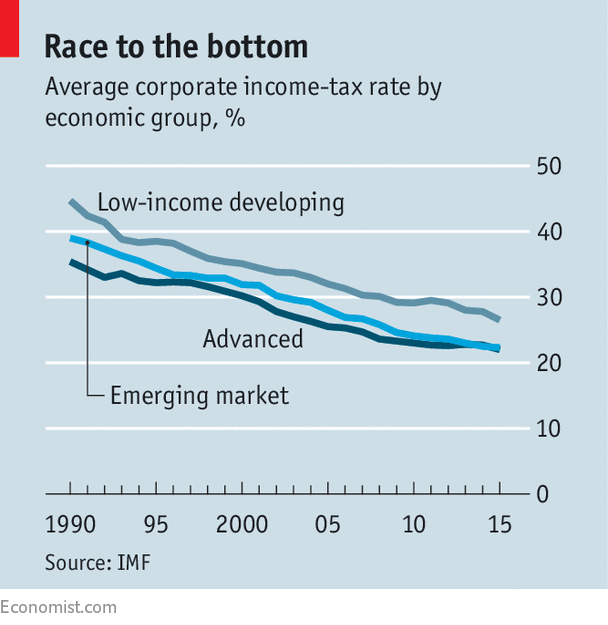 In response, countries have steadily lowered corporate-tax rates; since 1990 the average rate in advanced economies has fallen by more than 13 percentage points (see chart). Many rich individuals can choose to shift the way they report their income to take advantage of lower corporate-tax rates. So it is difficult to push up the tax rate on individual incomes while simultaneously lowering the corporate rate. As the IMF report drily remarks: “International tax co-ordination could potentially address this problem but has proved very difficult to implement.” So are there other ways to reduce inequality via the tax system? Another option discussed by the IMF is taxing property, which is an immovable asset. Inheritance taxes are another possibility, although they are costly to administer, and no G7 country raises more than 1% of GDP through this route. As a part of their efforts to roll back the 2010 Dodd-Frank Act, congressional Republicans have approved a measure that would have courts, rather than regulators, oversee megabank bankruptcies. It is now up to the Trump administration to decide if it wants to set the stage for a repeat of the Lehman Brothers collapse in 2008. CAMBRIDGE – In the next month, the US Treasury Department is expected to decide whether to seek to replace the 2010 Dodd-Frank Act’s regulator-led process for resolving failed mega-banks with a solely court-based mechanism. Such a change would be a mistake of potentially crisis-size proportions. The courts cannot fulfill these tasks alone, especially in the time the proposal under consideration has allotted – a 48-hour weekend. Unable to plan ahead, the courts would enter into the restructuring process unfamiliar with the bank. Moreover, the courts cannot manage the kind of economy-wide crisis that would arise if multiple mega-banks sank simultaneously. And they cannot coordinate with foreign regulators. In short, completing a proper restructuring would require contributions from regulators, including pre-planning, advice, and coordination. Yet, far from accepting these contributions, the plan would largely cut regulators out of the process. For example, the plan would bar regulators from initiating a mega-bank’s bankruptcy, leaving it to the discretion of the bank’s own managers. In the nonfinancial sector, failing companies often wait too long before declaring bankruptcy, so creditors may step in to do some pushing, potentially even forcing a bankruptcy of a failed firm. While bank regulators have tools to push banks similarly, their most effective one is the power to initiate a bankruptcy when it is best for the economy. Taking this tool away could have severe adverse consequences. Bank executives, like sinking industrial firm executives, have reason to “pray and delay,” hoping that some new development will save them. But if a failing mega-bank runs out of cash during such a delay, the risk that its bankruptcy will be disorderly – as with Lehman Brothers in 2008 – rises, as does the potential that it will wreak havoc on the real economy. The simple fact is that government regulators can do things that courts cannot. Courts lack the staff and expertise to come up with a nation-wide recovery plan. Moreover, they cannot lend to a cash-poor wobbly bank until it can stand on its own. The government can do that – and it can make sure that either the bank will repay the loans (by getting good collateral) or that the financial sector overall will cover the repayment (as Dodd-Frank authorized and required). When courts preside over nonfinancial bankruptcies, they depend on private lenders to provide emergency liquidity. But in a financial crisis, weakened banks cannot lend, meaning that the government must serve as the lender of last resort. And to play that role well, the government must be deeply involved in the bankruptcy process, so that it can jump in if needed. The current proposal, which the US House of Representatives has already passed, has other major flaws. For starters, American mega-banks operate worldwide, typically with a significant presence in London and other financial centers. If creditors and depositors of a failed American mega-bank’s foreign affiliate run off with the cash they held there, or if a foreign regulator shuts down that affiliate, the US bank would be in an untenable position. Yet courts cannot negotiate understandings with foreign regulators. American regulators can, but only if they can control the timing of the bankruptcy, and otherwise engage in the process. To be sure, the bankruptcy bill now in play is useful. But it is not robust. It would not allow broad-spectrum, full-scale bankruptcies, in which failing operations are closed under the court’s aegis, viable operations are sold, and debts are restructured up and down a company’s balance sheet. Rather, the current proposal envisages a limited-scale weekend restructuring, requiring that a precise loan structure be put in place years ahead of time. The bank would be closed on Friday evening, unburdened of pre-positioned evaporating debts over the weekend, and reopened on Monday morning, without (in the best-case scenario) needing a government bailout. If successful, this kind of rapid-fire bankruptcy process would be valuable. But it has never been tried. To have any chance of re-opening on Monday morning, a bankrupt bank’s billions of dollars in long-term debt would already have to be structured in such a way that a bankruptcy court could eliminate it over a weekend. But bankruptcy judges would have no knowledge in advance of a bank’s debt, and they would need more than a weekend to determine whether that debt could be properly stripped out. Government regulators, on the other hand, could do this in advance. And yet, under the current proposal, their official means of doing so would be sharply rolled back. Bankruptcy, if it works, is a good way for a failing firm to restructure or shrink. But if a failing mega-bank cannot open on Monday morning, the financial system will need backup. Under the current proposal, the absence of a regulatory safety net could result, if the weekend restructuring fails, in a global chaotic free-for-all, just like the one that followed the 2008 Lehman Brothers bankruptcy. Maintaining financial stability in a crisis is too important for us to pin our hopes on a narrow bankruptcy channel. The courts can help, especially after they have developed a routinized process for restructuring banks, as they have done with airline restructurings. But we should be wary about relying on courts to do things they have never been asked to do before. The House already voted, precipitously, to replace the regulator-led restructuring system with a weaker court-led setup. 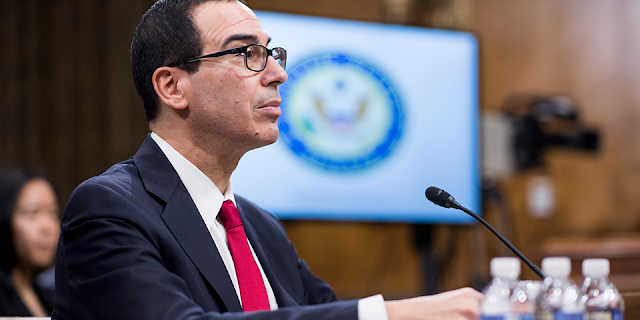 Let’s hope that wiser heads at the Treasury Department prevail. A letter to Congress with a similar conclusion was signed by 120 academics with expertise in bankruptcy, banking regulation, finance, or all three.